On 14 December, the United States Department of Agriculture (USDA) proposed updates to food labelling that go beyond “Best By” and “Sell By.” The food standards agency’s guidance looks to minimise food waste by making sure that the customer is informed with more specific information. In a news release by the USDA’s Food Safety Inspection Service (FSIS), it is said that many consumers wonder how long food can safely be stored. The FSIS is urging food manufacturers and retailers to stick a “Best if Used By” date on products as “these changes will give consumers clear and consistent information when it comes to date labelling on the food they buy,” said Al Almanza, USDA Deputy Under Secretary for Food Safety. Studies have shown that this phrase is easy to understand and indicative of quality, not safety. According to USDA estimation, about 30% of food is lost or wasted by both retailers and consumers. 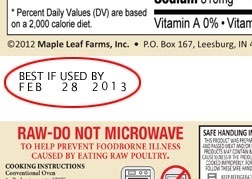 In most cases, when food is handled properly, it is perfectly safe to eat things past the date printed on the packaging. However, the ambiguous nature of “Best By” and “Sell By” can be misleading. “Sell by” has no bearing on the food product’s safety or quality, it is simply a phrase dictating how long the manufacturer thinks a product is good for. “Use By” is an indicator of when a product is at its freshest, but a product is still good past this date, according to Consumerist. With the new guidelines proposed by the USDA, “consumers save money and curb the amount of wholesome food going in the trash” stated Almanza. Federal law dictates that infant formula must provide consumers with product dating, the only food product with legal requirements to do so. However, food companies have made it common practice to include dated coding on nearly every food product on shelves. Think back to your last shopping trip. I bet that every single item you purchased included a date of some kind on its packaging. As dated coding is not mandated by law, the practice has resulted in labels that are anything but uniform. While some of the information provided by food companies can be hard to misconstrue, the lack of a standard, basic guideline can be downright confusing.